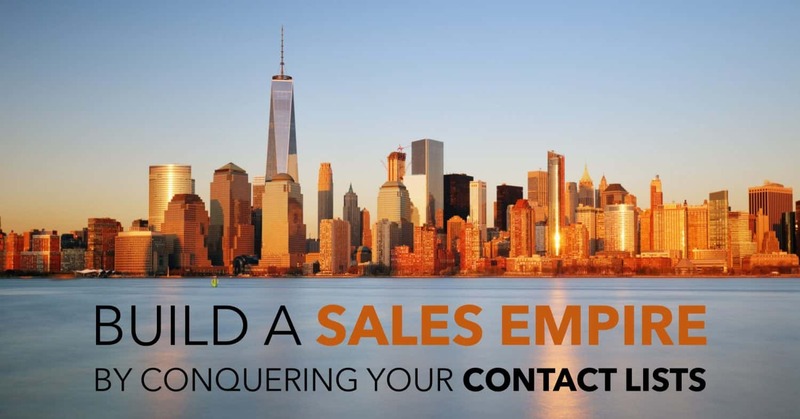 Build a Sales Empire by Conquering Your Contact Lists | xPotential Selling Inc. Arrange your contact lists into these five (5) categories for a highly effective way to create greater sales opportunities. The lifeblood of your sales career resides in the quality and quantity of your lists. Everyone in your pipeline is not the same, so don’t treat them the same. You have a different relationship with each one and it’s constantly changing. You can greatly improve your effectiveness by simply segregating your contacts into unique categories that identify the nature of your relationship and subsequent activities. This is your best list. Those who buy from you are the most likely to help you win additional business. They will also provide you with referrals and testimonials. You should know their industry, size of business, buying motives, buying habits, and your value to them. Seek opportunities to upsell and leverage new relationships. Tip: I send a custom labeled tin of the most delicious cookies to anyone who sends me a referral that ultimately buys from me. This simple gesture of gratitude has yielded many new customers. This list contains the contact information of those who fit your target market, but have never bought from you before. The demographic information should match your best customers to increase your contact to first appointment ratio. Contacting organizations that fall within your ideal customer profile yields the best cold call results. Tip: Focus your prospecting efforts on people or organizations with as many demographic elements possible (industry, title, # employees, etc. ), since people prefer to buy from salespeople who have experience serving in their industry. These are people with whom you are actively engaged in the sales process. They have some (not all) of the characteristics of a qualified buyer. They will possibly close within your current quota cycle. Don’t confuse these with the nurture list contacts. These buyers have a definitive purchase or delivery date. Tip: Never over-exaggerate a prospect. I live by “reality-based” pipeline management. If they are not qualified, don’t push them higher up the list. Qualify rigorously every sales opportunity so you don’t get burned at the end of the month when a deal does not close. This is a list of your referral partners. Don’t confuse these with customers who provide you with referrals. The people on this list work in complimentary industries. It’s mutually beneficial to share leads and customers with them. Discuss with your referral partners what a qualified buyer is for each of you. That way everyone understands who is a good prospect and who is not. Tip: Meet regularly with your referral partners and keep a record of their ideal customer profiles. You gain a lot of credibility with buyers offering legitimate resources that help solve their most pressing issues. This list consists of people who are not ready to buy right now. You must stay in contact with them over an extended period of time. They require a “touch” program so that you stay top of mind. Eventually, they will be ready to buy. A good CRM program can help you do this. Tip: I love newsletters, blog posts, Twitter updates, etc. Anything that is simple to do to stay relevant to a buyer. I had a prospect that received my newsletter for three (3) years before he bought. Let technology manage the process for you and move on to the next opportunity! Organize your contacts into these five categories. You’ll experience a sharper focus prioritizing your sales activities. As a result, you’ll earn more sales.